These seven Arts & Crafts designs were originally created by English architect C.F.A. Voysey circa 1900. Guildcraft Carpets began producing these designs in collaboration with the venerable Donegal Carpets company of Ireland, now sadly defunct. The designs are carefully rendered in authentic period colours, which coordinate beautifully with original and reproduction fabrics, upholstery, and wallcoverings. Hand-knotted in India of pure New Zealand wool, the GuildCraft carpets possess a uniform colour and surface texture. The look is authentic to the period, and our clients rave about the soft hand and plush quality of these carpets. These carpets are Goodweave-certified free of child labour and available in both standard and custom sizes. 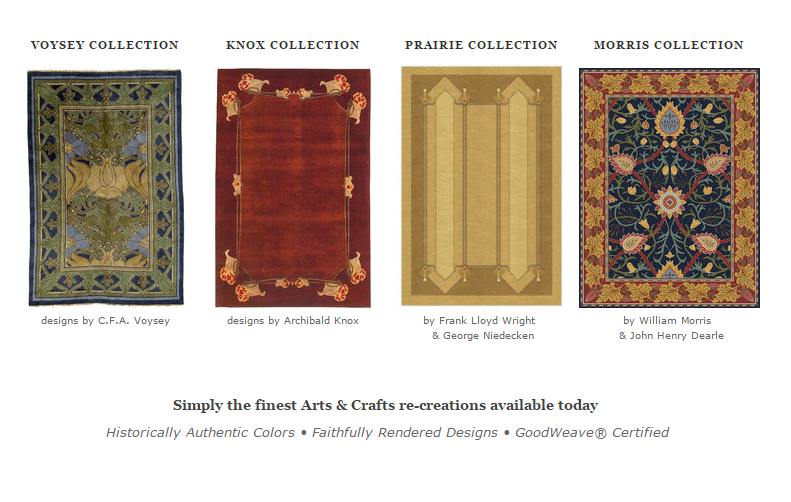 These and other Arts & Crafts Movement, Art Nouveau, Mission and Prairie Style carpets are available for purchase on our partner site, GuildcraftCarpets.com.